over the last couple months kesh and i have started an unspoken tradition... wednesday lunch. wednesday mornings are quite busy in her household as she has to get herself, her hubby and her 2 kiddos ready and out of the house first thing since she teaches a pre-school class at church that morning. wednesday mornings are usually some much needed downtime for me cause i work all afternoon and night on those days. so i started getting calls around noon on wednesday's from kesh asking me where i was and did i want to meet her and the girls for lunch. naturally i made it happen and it's been occuring ever since. where we go always changes... panera... max 'n erma's... chik-fil-a... subway... signature... but no matter where it is a good time is always to be had. kesh and i get to catch up on the past week (especially if we haven't seen each other) and i get to giggle at my adorable little nieces and melt when kyra says "susie" in her irresistibly cute little voice. 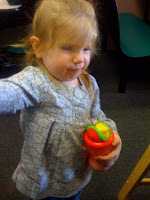 then there's my little kylie joy (or ky-ky) as i so lovingly refer to her. she is always so happy... just sitting so contently in her little seat all snuggled up. 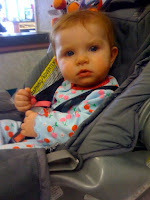 today she had on the most adorable cherry covered pajama's. precious. she too was jabbering away in her baby talk and throwing her hands in the air as if to exaggerate the very important things she was trying to say. she kept looking at me with those big blue eyes.... ahhh! i can't take her cuteness!!! so all in all it was a nice time as always. our lunches out give me a good reason to look forward to the middle of the week as opposed to dreading it. thanks girls! well it's been a crazy week so far, but a good one! i once again flew over the atlantic to conquer new territory! this time i find myself in romania... a beautiful country in eastern europe that is filled with people who are hungry for jesus. my time here has been so different from all of my other missions trips, but that is so exciting to me. every place i go is so unique and special and always takes a piece of my heart when i leave. the first 4 days were spent visiting churches in nearby villages. yes, they do refer to small towns as villages but these are very different from the villages i experienced in africa. although not quite as poor they still have very little and get the same curiousity over americans visiting. it's been amazing to see the faith in these little churches... many of which are very new and being led by people who just met jesus themselves! one church we found is being led by a 17 year old girl in her home. we packed over 30 people in an 8x10 room in her house and found out the next day that 15 of those people made a decision to follow jesus that night. it's been so humbling to be used by God in this way. there are so many stories and amazing testimonies of God's goodness, but i can't share them all now. we spent a day traveling around the mountains of romania yesterday and were in awe over the beauty of this country. today we arrived back in the capital city to visit with a friend of my parent's who has an orphange here. it's a very peaceful place and praise the Lord it has wireless internet! so here i am using my precious naptime to blog. haha! here i am standing out back of the church my parents are helping to build in one of the villages. faith praying for people with a new friend clung tightly around her. the children here are precious! my brother jim helping to construct a wall in the new church. so all the cool people out there in blog world are doing this photo challenge every month and it's fun to see what everyone comes up with. i am by no means a good photographer but i appreciate a good picture and every once in a while feel like i can capture a good moment. 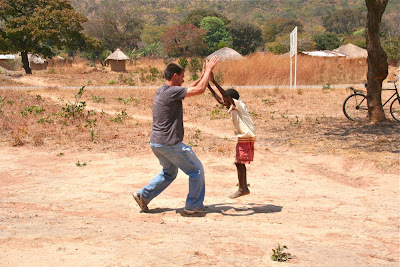 this past month the photo challenge concept was "mid-air" and as i've been perusing people's blogs, admiring their photos i remembered a picture i took in africa that fits this category. so without further ado... here's my photo.